Description: Ascending or erect shrubs to 60 cm high, villous to pubescent with simple and stellate hairs. 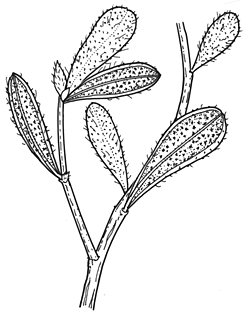 Leaves obovate to oblanceolate, 4–20 mm long, 2–7 mm wide, apex obtuse to rounded to truncate or emarginate, base tapering, margins recurved; upper surface at first hairy with a few simple hairs or rarely stellate hairs, becoming ± glabrous, with wart-like bases of hairs remaining, lower surface densely stellate-hairy, velvety to pilose. Flowers terminal, 1–3, 2–7 mm long; peduncles 12–15 mm long. Sepals 3–4 mm long, outer surface shortly stellate-hairy, sometimes hairs with unequal branches and surface appearing pilose. Petals 3–6 mm long. Stamens usually 4–6 mm long, on one side of the carpels. Carpels 2, stellate-hairy. Distribution and occurrence: In heath or open forest, on sandy soils, mainly in coastal areas. There are hybrids between H. aspera subsp. aspera and H. empetrifolia subsp. empetrifolia with an a high percentage of abnormal pollen in areas where the two species grow together, e.g. at Thirlmere, Picton Lakes and Green Cape.